blink® -n-clean 1x15 bottle; or clearer, more comfortable vision during contact lens wear. 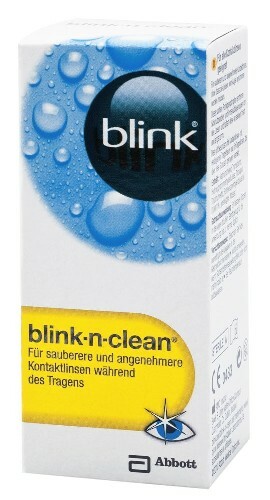 blink® -n-clean 1x15 bottle; eye drops for clearer, more comfortable vision during contact lens wear. The blink®-n-clean eye drops are formulated to give contact lens wearers clearer more comfortable lenses. This gentle solution does more than just re-wet, it washes away natural debris and protein build up to leave the lenses clear, fresh and comfortable. It is particularly useful for extended wear lenses or when wearing the lenses for longer periods of time.